Partial archive of an American anarchist newspaper published in the 1930s. Just stumbled upon this a couple weeks ago. Can't even track down the site I found it on, unfortunatly. Haven't been able to find much more info on it other than a Facebook post selling a copy. In the dark days of the Depression, one of the beacons of light was Man! : A Journal of the Anarchist Ideal and Movement. It was the most celebrated anarchist publication at that time. The very gentle anarchist who never killed a fly." [Havel, Hippolyte]. Man! A journal of the anarchist ideal and movement, Volume 5, Number 2-3, February-March 1937. New York City: Hippolyte Havel, 1937. 8p, 12x17 inches, paper in very good condition, 2-inch tear from center fold into text block, very mild edgewear, pages unopened. 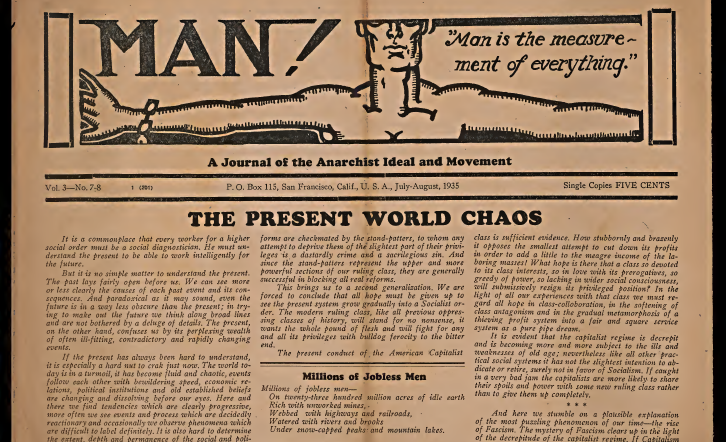 The most influential U.S. anarchist periodical of the 1930s. Front page features leaflet text distributed by the Italian Anarchist Federation on the situation in Spain with a dramatic graphic at the bottom of the page and a quote from Errico Malatesta, articles on Warren Billings, FDR's Supreme Court packing plan, memories of Kronstadt, the death of Max Weiss, and on the power-hungry US government. "Man is the measurement of everything." Founder Marcus Graham (Shmuel Marcus - 1893-1985) a Roumanian immigrant, edited a number of anarchist publications including the illegal New York journal on the Soviet Union,Anarchist Soviet Bulletin (1919-1920), and Free Society (1921-1922). Man! was his last major publication. He spent much of his life fleeing from prosecution by immigration authorities and lived underground, using pseudonyms, for his last 45 years. Havel took over the publication while Graham was in self-imposed exile. This and the Libertarian League or something like that were some of the only outfits putting stuff out in the 50s right? There is an archive in Cambridge that has a lot of this material. The Libertaian League came along in the. 1950s. There was also Retort!